29 January 2017 – Reports say gunmen believed to be Boko Haram extremists on Saturday attacked a convoy of motorists along the Maiduguri-Biu highway which was recently secured by the military. Unconfirmed reports said seven people were killed in the attack. However, the Theatre Commander of Operation Lafiya Dole, Major General Lucky Irabor, told Channels Television on Sunday that only one person was killed in the attack while others were injured. General Irabor stated that the military did not suffer any casualty in the attack. The Maiduguri-Biu highway has been one of the most dangerous routes in Northeast Nigeria in the last three years due to Boko Haram attacks. 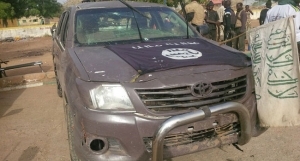 The incident came three days after Boko Haram gunmen suffered a heavy loss of their members, after a foiled attempt to attack a military base in Borno State. In that incident, a large number of the insurgents stormed a military base in Kamaya, but failed to dislodge the soldiers.